Questioning Capacity: How Quickly Will Crossrail’s New Trains Fill Up? We had gone for quite a while without looking at Crossrail other than to publish some of the dramatic pictures made available showing the progress of the construction works. That had already started to change with our look at the report of the National Audit Office on the progress so far on Crossrail. This in turn was followed by the recent announcement that Bombardier would be providing the rolling stock for Crossrail. It seems then that perhaps the time has come to look again at the line and the different aspects of this project. 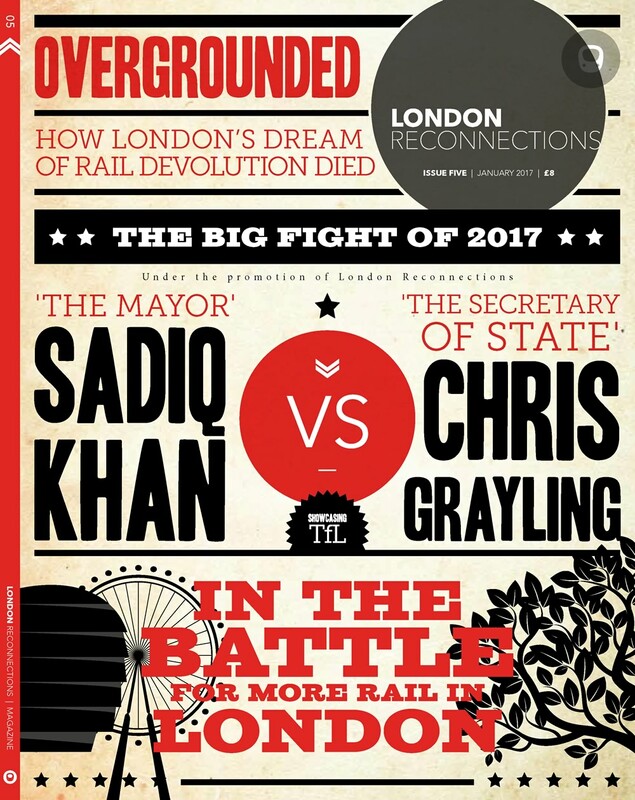 This particular article looks the implications of a recent report that has been published, notionally but not really, about Crossrail and one aspect of the much less readable (but considerably more important) Draft Further Alterations to the London Plan which was published in mid-January and which isn’t about Crossrail at all. The true population of the United Kingdom and especially London has been, for a long time now, a contentious issue. For many years some of the chattering classes have insisted that official figures contradict other indications. Most notably the fact that it is fairly well known how much energy an average household of a specific number of people likely uses, and the total domestic energy usage does not seem to equate to the supposed population. Other indications such as the need for medical services, particularly in Accident & Emergency in the NHS, also seem to be considerably above the proper average that statistics have laid down for our guidance – as Lady Bracknell would have said. More pertinent to our discussion, London has seen a surge in public transport use. Some of this could be explained away by other factors but the surge in core journeys to and from work by all forms of transport – public and private – has consistently defied any really plausible explanation other than that there were more people around. A notable feature of recent years has been a huge rise in public transport usage – notably on London Overground but also on Tramlink and other services. This was partly put down to a “improve the quality of service and the passengers will come” belief but even so the reality appears more and more to be that there is a latent demand that will seize any opportunity for new and better connections. It is very noticeable that much trumpeted improvements on the Underground, such as greater frequency of trains in the peak period, lead only to a very short term improvement before trains quickly fill up and the Tube remains just as crowded as before. A new non-Olympics daily record was set on Friday 6 December  with 4.53 million [Underground] journeys made, which is only 14,000 fewer than the record set during the Games. So, by the time you read this the Underground may already be at is busiest ever and roughly 50% up on the figure of 3 million a day which was generally quoted for much of the late 20th century. One of the frustrations for commuters is that they can see there is a problem today and they are savvy enough to realise that providing 12-car trains instead of 10-car on the National Rail network, increasing Thameslink from 16tph to 24tph (but a lot of them still 8-car) in the core section or upping the frequency on the Underground lines by a few tph are not going to solve the problems. All they do is buy us time. One can almost envisage Neville Chamberlain waving around his tablet computer showing the Tube Improvement Plan and reassuring us that all is well. I predict that when Crossrail opens in 2018 it will be immediately full. The people who predicted that it will take all the traffic out of Oxford Street or that we’ll be able to sit down on the Central Line in the rush hour will be wrong. It will just be full up with people. A soundbite or a serious concern? We have to issue the relevant health warning to accompany what Sir Peter says. It is a bit of a soundbite and shouldn’t be taken too literally. It was probably said to shock some people out of their complacency. He would almost certainly admit he didn’t really mean literally on day one. In fact, given Crossrail won’t be fully open until December 2019, one suspects Sir Peter would concede that one would have to stretch the definition of a “immediately” to mean “within one or two years”. Nevertheless, as with “we will never order an underground train with a cab again”, regardless of the strict accuracy, the general thrust of what is being said is probably true – and if anyone would know, he would. There is also the issue that a perception of full (e.g. “I could only just managed to squeeze onto my carriage”) isn’t quite the same as figures showing that there was no space in any of the carriages on the train for passengers. So we have a problem. We also have a solution – Crossrail. It has been repeatedly stated that Crossrail will increase public transport capacity in London by 10%. What else have we got? Well, basically, to quote Private Eye: Err, that’s it. So what if Sir Peter is right? What happens when Crossrail is full up? Last month a report commissioned, at least in part, by the New West End Company and produced by Arup was published. It got quite an airing on the BBC local news. The news report stated that by 2026 many more people than previously thought would be heading to Oxford Street via Crossrail. This was the conclusion reached by looking at the expected figures for passenger numbers at three central Crossrail stations then. Not surprisingly the New West End Company were calling for dramatic measures to accommodate the greatly increased footfall which would make the environment outside two of the stations (Bond Street and Tottenham Court Road) more pleasant for the increased number of shoppers that, it was presumed, would be using them. As is often the case, one has to be careful at taking commissioned reports at face value. To get the figures to be much more dramatic the report highlights the increased prediction over the 2004 estimate and downplays the 2010 and subsequent updates. So, much higher than previously thought once upon a time but not so much higher than the current figures. Basically it is rather misleading. The report looked at three Crossrail stations and the increase at those stations – so they did not confine the increase to Crossrail. Of course if you are the New West End Company it makes no difference to you if the person leaves Bond Street station having travelled by Central Line, Jubilee Line or Crossrail. That is fine but you can’t then legitimately subsequently use these figures to produce headlines such as New report suggests Crossrail to handle a quarter of a billion visitors by 2026 when it doesn’t suggest anything of the sort. In particular one of the three stations investigated was Farringdon and a lot of the increase in entry and exit figures will be down to Thameslink – not Crossrail. “With London’s population growing by two thousand every eight days, Arup’s analysis suggests Crossrail’s stations will be somewhat busier sooner than was originally anticipated. This is in line with the experience of London Overground improvements and DLR extensions. Crossrail stations are designed to handle the flow but there are going to be significant opportunities – and some challenges – for property owners, local authorities, retailers, employers, the entertainment industry and residents. Immediately the reason for the amazing figures Arup produced is clear. London’s population growing by two thousand every eight days? How on earth did they arrive at such a large – and such a specific – figure? And why is this figure far in excess of what TfL are quoting? As recently as last September in a presentation to Camden Council TfL reiterated their standard soundbite on the subject that “London is growing at a rate equivalent to Tube train full of people added every week” – in rough terms that represents growth of approximately 750 people. 2000 people every 8 days would therefore represent a growth rate of roughly 265% of TfL’s estimate, equating to 91,250 people a year. TfL’s presentation predicts 750,000 more people by 2031 – around 42,000 a year – or a very packed tube train of 800 people a week. If Arup’s figures weren’t at variance enough with TfL’s figures, Tony Travers, the generally well-respected economist from the London School of Economics, trumped that by appearing in front of the BBC cameras claiming that London’s population was going up by 100,000 a year. Clearly someone has to be wrong. At times like this it is clearly best to ignore the hyped report of Arup and take a sober look at the much more reliable and official figures from the London Plan – reliable because these figures will have been carefully prepared after a lot of research, without any desire (conscious or otherwise) to produce the sort of figures the client wanted to hear. So we can dismiss the Arup figure and use figures that are more dependable. For this it is very fortuituous that the GLA has recently published its draft Further Alterations to the London Plan (FALP). When one delves into FALP and finds the projected population figures one then comes to the very, very sobering conclusion that Arup, if anything, has underestimated population growth. One can quibble about some of the finer details of their findings but they are, in essence, correct. The critical document is FALP Chapter 1 – context and strategy. These projections suggest that London could grow by 91,000 – 106,000 pa in the decade to 2021, and over the term of the Plan to 2036 by 64,000 – 88,000 pa. Remember Crossrail is due to fully open in December 2019 so, between 2011, when the population according to the census was 8.2m, and 2021, we can expect London’s population to grow by around a million. With these figures, the fact that Crossrail will provide an increase in London’s public transport capacity of 10% doesn’t look as if it is going to be anywhere near adequate. All it is going to do is help provide some of the capacity to enable us to stay as we are. It is not solving anything. As published in FALP Context and Strategy. 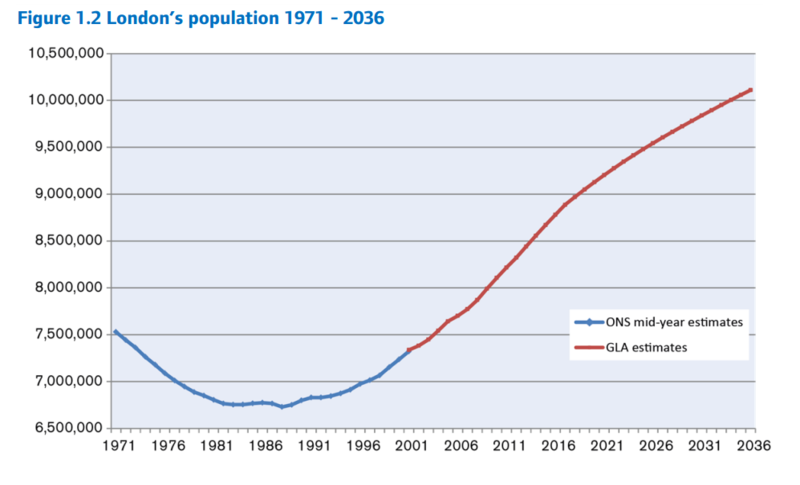 Original source: Office for National Statistics mid-year estimates to 2001, GLA estimates 2002 to 2036. To continue our look at Crossrail it helps if we introduce the word prolepsis (we have Graham H to thank us for bringing it to our attention). Prolepsis is, according to one of its definitions, the representation of something in the future as if it already existed or had occurred. A good illustration of prolepsis exists on the prolepsis.org website. Many people are showing indications of prolepsis when it comes to Crossrail. There is one critical group of people who, it could be argued, take a prolepsic attitude to Crossrail and that is property developers. Nowadays property developers do not wait for upgraded public transport to actually exist before they build and put out their property for sale or let. If one was in any doubt about this then a walk around the Victoria Station Upgrade site should make this clear. Victoria Underground station is at capacity in peak hours and on both the Victoria northbound and the District and Circle platforms one cannot expect to be able catch the first train that arrives. Worse than that the barriers to the solitary escalator to the Victoria Line platforms from the Victoria Line ticket hall are often closed for a few minutes in the morning peak to prevent a build up of crowds on the northbound platform. There is a substantial upgrade planned to open in two stages in 2016 and 2018. Around Victoria there is massive office development going on and much of the surrounding area is a building site. The station cannot cope now even though these sites are devoid of offices or anything else that would generate many passengers. It is probably a fairly safe bet that, when the station upgrade scheme opens, not only will the capacity issues on the Victoria Line not be fully resolved, but the District & Circle Lines will also be in an even worse situation. Canary Wharf is in a similar situation to Victoria only on a much larger scale. There had been a pause in construction but now there is lots of activity. One gets the feeling this is timed so that by 2018, when Crossrail opens via Canary Wharf to Abbey Wood, new offices will be available. The idea of the developers, no doubt, is to let or sell them at such time as when the public transport is best able to cope in order to make the property as attractive as possible to clients. It also helps if you aim tap into the market before your competitors. Of course this only really works if you have this idea and your rivals don’t. So the reality is more that developers are anxious to take advantage of new stations as soon as possible in order not to get left behind in the property market. It is easy to envisage that public transport around 2020 at Canary Wharf is going to be struggling just as much as it was in 2010. One must not think that this problem will be isolated to the Abbey Wood branch of Crossrail. Links between Stratford and Canary Wharf are currently inadequate with the Jubilee Line busy and the DLR crammed in the peak hours with through passengers from Stratford to Canary Wharf. Undoubtedly some of those living on the Shenfield branch and working at Canary Wharf will use Crossrail and change at Whitechapel to get to work. With a predicted journey time of only 9 minutes by Crossrail it is also likely that many people changing at Stratford for Canary Wharf will continue their journey by Crossrail even though their journey by that route involves a further change. Of course, the phenomenon that is taking place at Canary Wharf is not confined to that location. A lot of people (including Arup) are predicting that Farringdon is ripe for business expansion having been for many years a place that is neither here (the city) nor there (the West End). We are also seeing Crossrail being very quick to do deals to sell the site overspace at stations which is being snapped up by speculators – although speculators may not be quite the correct word given the near certainty of the attractiveness of the site to those searching for convenient office locations. On top of the extra demand at Canary Wharf we have seen when looking at the Piccadilly Line that it is quite likely Crossrail will be expected to handle a greater proportion of rail travellers from Heathrow to London. And, as commenters have pointed out, although Heathrow is operating very close to absolute capacity when it comes to flights this is not the case with passenger numbers and, as planes get larger and carry more people, this number is bound to increase. London’s population is set to grow from 8.4 million today to around 10 million by 2030. Government, the Mayor of London and Transport for London are investing in Crossrail and other transport infrastructure to support access to jobs, education, housing and to boost economic growth. This is presented as an amazingly positive message. Taken in conjunction with the much quoted “Crossrail will increase our transport capacity by 10%” it really does not appear to be great news. Putting it another way, in sixteen years time the population of London will increase by 19% on what we have today whilst he only really big infrastructure improvement to London’s transport system that is actually currently being built can only cater for just over half that increase. This is to cater for increased demand on a system that is already overloaded today. It is true that we do have the final phase of Thameslink to be delivered but much of the capacity benefits of that scheme have already been realised. So, if you want evidence from the government department in charge of this that Crossrail on its own is going to be hopelessly inadequate then just read their own press releases. We can see that, if the latest population predictions are correct, the long term future-proofing of Crossrail looks like being used up in the first few years – replicating what happened on the Jubilee Line Extension. The stations appear to have been designed to be large enough to handle this capacity and are not generally expected to be a problem. One issue may well be, as highlighted by the Arup report, that our pavements and roads just will not be geared to this number of extra Crossrail passengers in the first few years. No-one has really produced a workable solution to the Oxford Street problem as it is today and it looks like it is going to get a whole lot worse. One further issue – when considering the problem of Crossrail being full up pretty early on in its life – is that, until the project is regarded as complete spending is going to be closely scrutinised – as we have already seen in the NAO report. There is great pressure to deliver on time and on budget. Even if the external pressure did not exist there would probably be internal pressure in order to show to the government that TfL could be trusted with large projects. In particular, should more detailed planning on Crossrail 2 be authorised in the not-too-distant future, the government could be confident that there would be no major cost overruns with TfL in charge. So, it would appear that any obvious attempts at mitigating future problems by, for example, ordering more trains or longer trains or both would not be acceptable. In fact no extra expenditure on this basis would be acceptable. If Crossrail were to go to Reading it will be interesting to see how the above accounting issue is dealt with. No doubt the public justification of appearing to be breach Crossrail spending limits would be that overall (taking into account other operators costs hence the value of the franchise) costs would be cheaper. This is presuming that the cost of extra rolling stock to Crossrail exceeds any Crossrail savings otherwise made – it is hard to see how this wouldn’t be the case. And then the question would be, if you can take this attitude once, why can’t you do take this attitude any number of times? It seems that if we look forward to the early 2020s Crossrail may well be full up and we will be talking about how in the past we managed without Crossrail. And some of the people who have a penchant for obscure words would recognise that as a form of analepsis. In one or more future posts we intend to to what options are, or will be, available in the event of Crossrail being “immediately full”.